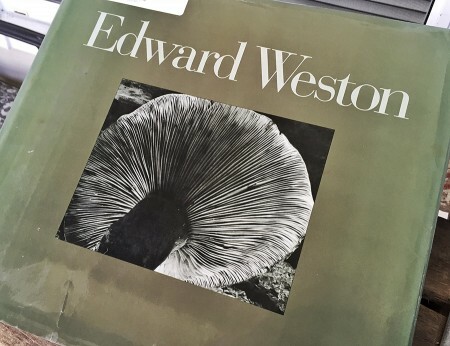 The focus this week is on a few things I picked up in more-or-less the middle of nowhere on Colorado’s eastern plains: An Agfa B-2 Cadet, a Sears Tower Model 7, and an Edward Weston book. All three came from antique stores in small towns, which I visited while scouting and photographing for the secretive project I’ve been working on. A friend and I made a couple of semi-planned drives around the plains east of Denver and Pueblo. In one of the first towns we visited we found the remains of an old painted sign on the side of a brick mercantile building, offering for sale “Kodaks” — a reminder of an era when Kodak was keen to become genericized as part of their marketing juggernaut. It set a good tone for our trek. We’ve explored every extant habitation or visible remain thereof we could find in an area that covers much of nine counties in eastern Colorado, and I’ve found quite a bit to photograph. I’m excited to share some of what I’ve seen out there, though it’s not time just yet. 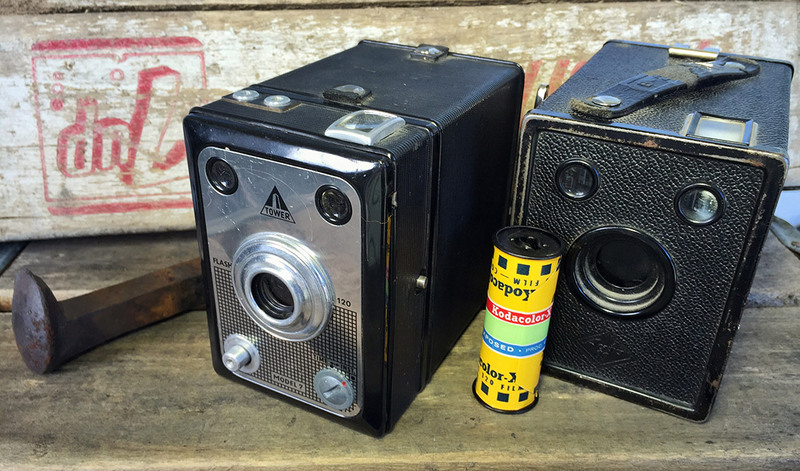 A simple 120 roll film box camera from about 1937, the B-2 Cadet came from a tiny antique store on the outskirts of Simla, Colo. The town was founded in the early 1890s along the Rock Island Line as the railroad expanded toward Colorado Springs, about 50 miles west. Inside the camera I found an exposed roll of Kodacolor-X film. Of course I don’t know when it was exposed, if it was all exposed or not, or whether it’s been kept sealed up in the camera in the years its been waiting to be developed or not. The roll appeared to have been finished, though, as it was all wound up on the nice steel take-up spool. I may re-roll it onto a plastic spool to save the steel one. I decided to try the ancient lick-and-stick adhesive label on the 40-year-old film (Kodacolor-X was made from 1963 to 1974). To my great satisfaction, the label still worked, though I put a rubber band around the roll just to be safe. So now the roll is waiting for me to process it. I’m not sure how to handle processing, though. I know Film Rescue International lists Process C-22 color films as having among their best success rate to get pictures off the film. But black-and-white remains an option, as well. It sounds like using B&W chemicals carries a little bit of risk, and of course I’d lose those great vintage colors. But I have plenty of HC-110 and I’m not afraid to dilute the heck out of it. If you have a suggestion on how best to process this film, please leave it in the comments below. Okay, we knew that, actually. So did JC Penney and catalog-pioneers Montgomery Ward. But they were all just rebadged something-elses. The Tower brand, though, apparently did well for Sears, Roebuck & Co. in the early-to-mid 20th century. This guy is super basic, apparently built by Bilora in Germany. Based on the example images I’ve found, though, it looks like the lens is quite a bit sharper than most box cameras this simple, and the vignetting seems lower than a box Brownie. I found it at a kitschy calamity called Cadillac Jack’s, an antique and pawn and junk store in Calhan, Colo. It’s one of the most packed antique stores I’ve ever been in, though it’s pretty neatly kept for being so full. I probably paid a little more than the Tower 7 was worth, but I don’t mind. It’s missing the ruby window in the back, but I’m sure I can find a workaround for that. Suggestions appreciate, if you have them. Calhan is an interesting place, though. It looks like it was on the edge of being a ghost town until NextEra Energy started constructing their Golden West Wind Energy project in 2013. Now the town has what several locals claimed is the busiest Loaf’N Jug in Colorado. It’s certainly the busiest I’ve ever seen. Further down the road, in a smaller town called Ramah (RAY-muh), we found an old mercantile that’s currently housing a bit of a junk shop that may help fund some restoration of the lovely, historic brick building. I saw a number of esoteric photographic accessories, but nothing I need or don’t already have. On the way out, though, a big book caught my eye. It’s a copy of “Edward Weston: Fifty years.” It’s a very large, square coffee table book, nearly 300 pages and about 200 lovely prints. I know of Weston, of course, but this is the first time I’ve had a good look at his work in detail, and it’s very impressive. This particular copy is pretty beat up, but that doesn’t diminish at all the beauty of the photographs inside. I look forward to spending more time with it. I know the blog has been quieter in the last six weeks or so, but I’m trying to reverse that trend. What started as a really smooth-sailing year had some karma fall on it recently and it’s been more of a struggle, but things seem to be stabilizing. I’ve been carrying the Pentax 6×7 so much and focusing on this project, I haven’t honestly had a lot of time for testing and toys. Back to that soon, though, I’m sure. I put up a new camera review a couple days ago (Fujica ST-605N) and have another mostly finished for next week.